WARNING - DO NOT ATTEMPT THIS REPAIR UNLESS YOU ARE EXPERIENCED IN WORKING WITH 240 Volt Circuit. Let's be very clear, if you dont know what you are doing, THIS WILL KILL YOU! 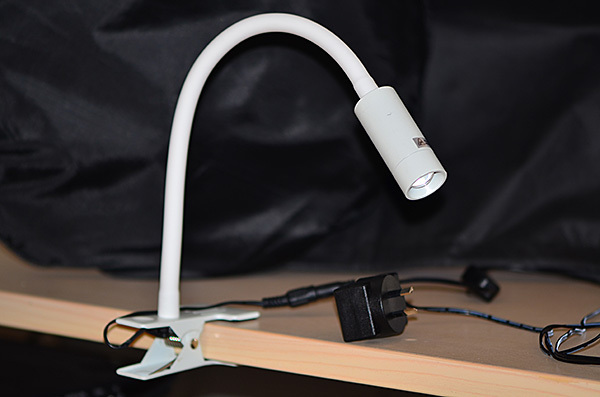 I bought 3 of these LED clamp lamp from Aldi in 2016. Their power packs are of inferior quality as one failed within a week so that was returned to store. Then a second one failed after 6 months. I couldnt find the receipt so I thought I will just repair it and also have a look at the design. Who would repair a $15 LED lamp???? haha Me!!! Update 29 May 2017, the third LED light failed. so this makes it 100% failure rate and it is the same problem as documented in this article. The powerpack supposed to output 13V DC and on the faulty power pack, it has no voltage output. There are no screws that held the 2 halves together. They are plastic welded together. You just have to literally crack it open. I used a chisel and just by tapping and leveraging I was able to crack it open pretty cleanly along the mid line. 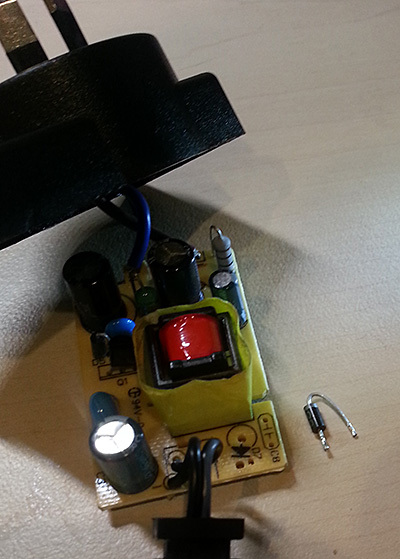 This is a SMPS - Switched Mode Power supply so there are live and dangerous voltage inside that can kill you. Without saying, dont disassemble it until you let it sit idle for 5 minutes after you unplug it. 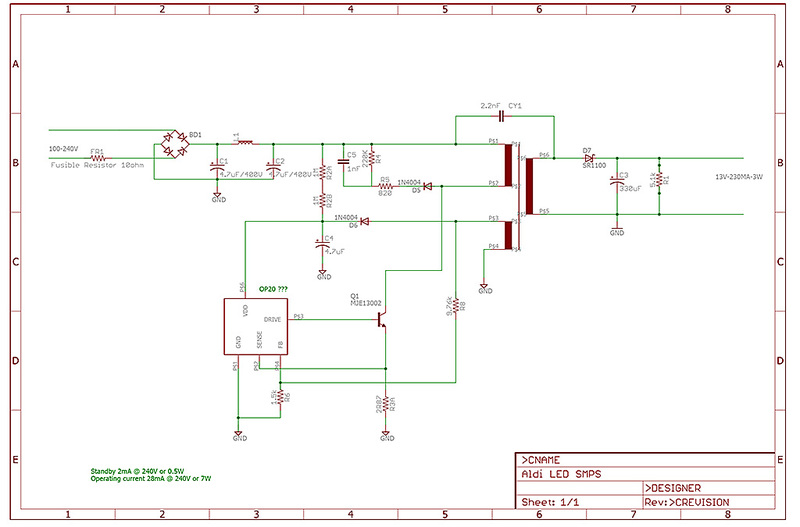 This length of time would allow the high voltage capacitor to self discharge. The typical vulnerable component on SMPS are diodes and output transistors / MOSFET. So I went straight to the output diode and lo and behold, it is shorted. 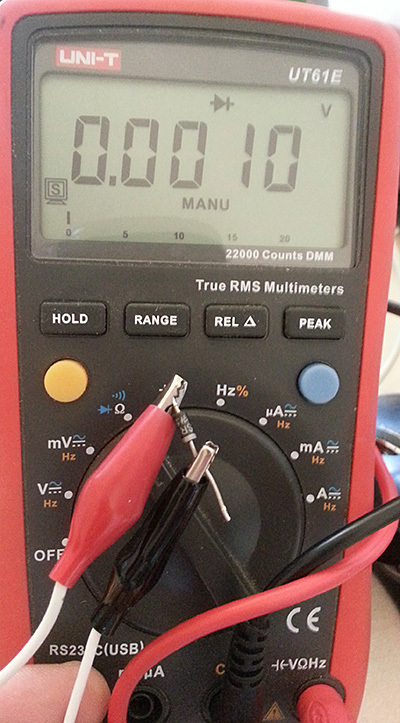 Set your DMM to diode mode and a healthy Schottky diode shoud have 0.3V and this one has 0.001V! This Schottky diode SR1100 is rated to 1A 100V. So I ordered some SR2100 (which is rated to 2A) from Aliexpress, they cost about $1 for 20. I would have more than enough supplies to repair these multiple times! Apart from the Schottky diode D7, the other components that are susceptible IMHO would be the transistor Q1. 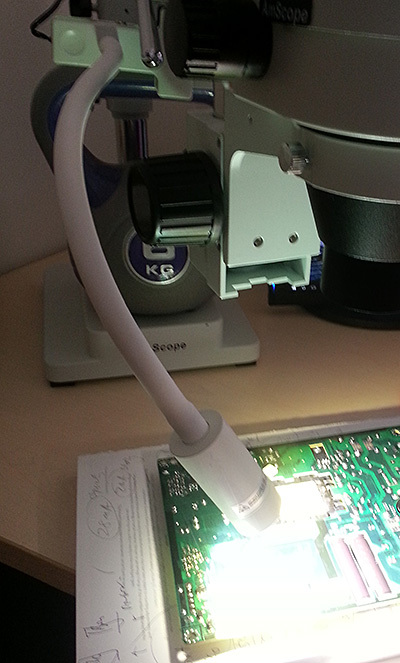 One word of warning, when you are replacing any components on SMPS, make sure you are replacing them with the same type. Capacitors are not just capacitors, there are different types and special ones are used for special purposes. For example, it is critically that CY1 is replaced with the same type as it is designed to fail open (although nothing is guaranteed!!!) instead of shorted. If they fail shorted, there will be dangerous live voltage on the output. Remember those cases where people have been electrocuted using non genuine iphone charger!? So pay attention!!! Just use super glue to glue the 2 halves togeher. And here it is clamping onto my trusty microscope working again. This lamp uses about 0.5W on standby and 7W when operating. Its standby consumption is OK but not the best and given that it is a low cost (did someone say Aldi!) item, it is acceptable.